Roza Kamhi, 82, lives in a big apartment in Skopje which she shares with her husband and her daughter's family. Around her apartment are a wealth of souvenirs and art from a long life. Amongst these items is a shelf with pictures of her living family members: her husband, daughters, and grandchildren. On the other shelf are pictures of the dead: her son, her grandchild who died of heart problems at a young age and a signed photo of Marshal Broz Tito  in full military uniform. Roza's husband, Beno Ruso, a retired general, served under the former Yugoslav leader, who remains a respected presence in their lives. Shortly after learning that her son died in a climbing accident in 1988 Roza became severely visually impaired. My father was a wheat trader and was considered rich, since he had two shops and owned a house. But slowly, slowly the income from trading dried up and in the end we lived off the rents. This was not L-rd knows what. The economic situation declined for all the Jews in Bitola at that time. My dad knew Turkish because he came into contact with traders and people from villages. As a trader, my father had contact with peasants, but he didn't socialize with non-Jews. My mother didn't know Macedonian, so it would have been hard for them to socialize. My father went to coffeehouses. These were coffeehouses for the whole population, they weren't segregated. He played backgammon, for Turkish delight or a coffee. It wasn't so much about gambling than to pass the time. He would go frequently for a coffee since he didn't have anywhere else to go. I went often to visit him in the coffeehouse and usually he would treat me to a Turkish delight, which I liked very much. My father loved me very much because I was the only girl. Many times he would carry me in his arms in the street, all the way home. He was especially attentive to me. My father did all the shopping. He went to the market, bought chickens and then had them slaughtered. Mother didn't leave the house. Father was responsible for shopping and things outside the house and Mother for things connected with the house. All of my father's brothers were rich. His brother Rafael lived in Salonica [Greece], where he owned a couple of stores, and he came from time to time to visit us. He came to Bitola when someone had a wedding or some other celebration. I don't remember him well. We weren't in the same company very often. He survived the war. He managed to escape the concentration camps when the rest of the Salonica Jews were transported. My Uncle Solomon's son, Zozef, had the first auto-parts store and one of the first cars in Bitola. When the Jews were taken to the camps he fled to Albania. [Albania, together with Kosovo as well as the ethnic Albanian parts of Macedonia, was occupied by Fascist Italy. Contrary to Bulgarian- occupied Macedonia Jews were not deported from the Italian-held lands.] Rich people had contacts and could move around better. A whole group of them went on a truck with goods. First they went to Albania and then to Italy. When he came back to Macedonia after the liberation at the end of the war, he was in Bitola. He married a Macedonian Jewish pharmacist from Skopje, Riketa. She survived because when the Jews were deported, the doctors and pharmacists weren't taken away [Editor's note: One hundred and sixty five Macedonian Jews were released from the Monopol detention center. These included 12 doctors and 20 members of their families, and 98 Jews who were foreign nationals. The doctors were released to work for the Bulgarians, who desperately needed their services, and the foreign nationals gained their freedom. Source: 'Last Century of a Sephardic Community' by Mark Cohen.] The army needed them to tend to the wounded so they were left behind. After they married they went to Israel. I was in Israel a few times and met with them. My mother was a good housewife. She tried very hard. What ever she could she gave to us. She worked very hard. One day she did the laundry, the next day she mended - in those days everything was mended, not thrown away like today - the third day she cleaned the house, and Friday she prepared for Sabbath. We didn't have ironing back then. We never had any household help. My mother did it all herself. We children were privileged while we studied; mother did everything for us. Sometimes relatives would come to the house. One relative would go to visit the other. So they did go from house to house visiting. At some point my mother did some crocheting and I helped her. My parents dressed in a modern way. My father wore a hat. He wore it outside and at work. He didn't have a beard. My mother wore a 'shamija': a kerchief with decorations around it. All of her hair was inside. The soon as she washed her hair she would put it on with pins and leave it there. My brother, Mois, finished the French school in Bitola, which was a very elite school back then. But there was great unemployment in Bitola and he couldn't get work. Mois went to Israel [then Palestine] because of poverty. He was unemployed. There was this enthusiasm: if we cannot do anything here, we might as well go and help build something there. My parents weren't against it. He went to Israel with one of the first groups from Bitola. He went to a kibbutz with a group. But he was weak. It was a very hard life there. And the life for those who first went to a kibbutz was truly for heroes. The climate was harsh, they worked very hard, and kibbutzim were not like kibbutzim today. These were truly heroes and fighters. He came back because of health reasons, something with his lungs; something wasn't good for him there. We had contact with him while he was there. He wrote that he was coming back. Although we never spoke about it, I think he was disappointed, why I do not know. When he came home he couldn't get work even at Monopol, the tobacco factory. He couldn't find work digging in the streets. He wanted to work but he couldn't find a job. My father, at that time, didn't have capital to buy him a store. There were poor Jews, who collected scrap metal. Once they gathered it they sold it [to another party]. [They brought it to Mois], he collected it, weighed it and then it was resold to someone else. This wasn't his own business; he worked for a boss, my relative, my aunt's son- in-law. I don't remember his name. I think he did this during the war. He went and he made a few dinars. It was minimal. He was very well-read and progressive but left with that kind of life. He was peaceful and sang very nicely. He was not with the partisans. He was in the Atehija society [a Jewish cultural and sports club in Bitola] when he was young. But I don't know what exactly he did there. He sang something. I know he was a member. I had more help from my younger brother, Pepo. Since he finished the same gymnasium as I did, he helped me with the things I didn't know for school. Pepo was a clerk in the municipality. I think he worked there until the end [deportation]. He wasn't a partisan. I guess he helped the movement. We Jews all helped the movement in one way or another. He was progressive, but I don't remember if he had some special function. I had another brother, Simaja, who I don't remember. He died after World War I. I don't know how old he was when he died. He was playing with other children in the fields where there were remains from bullets and bombs from the war. He put one of these in his pocket and it exploded and he died there in the fields. I never saw his picture nor did they speak about him a lot at home. My brothers were both progressive and both members of Hashomer Hatzair [in Yugoslavia] . My brother, Pepo, was rosh ken [head of the local Hashomer Hatzair organization]. When I was a kid I played with my girlfriends in the fields near my house. I had one friend from childhood, Adela Faradji, who lived close by and we were inseparable until she left for Israel after the war. We went to school together. I started school when I was either five or six. I remember that I would fall asleep during classes and because of that I had to repeat a year. I was too little, but they wanted to give me something to do, so they sent me to school. It was a Serbian school in the Jewish quarter for Jewish kids. 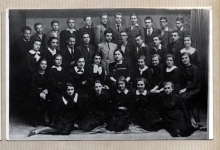 It was a Serbian school with Jewish students and non-Jewish professors. When I was in the third grade they transferred us to a school outside the Jewish quarter, I even think it might have been in the Turkish section. I don't know why they did this. The first school still operated, but for some reason they moved my grade to another school and then to yet another one. I spoke a language other than Ladino for the first time when I went to school. It was very hard, especially because it wasn't even Macedonian; it was Serbian. Macedonia wasn't free at that time; it was under Serbian control. [The territory of today's Macedonia was attached to Serbia as a consequence of the Balkan Wars (1912-13) and the Slavic-speaking Macedonians, as a pretext, were considered part of the Serbian nation by Belgrade.] With the kids that we socialized with from school we spoke Macedonian, even though it was hard for me. It was very hard for me to get by in Macedonian, because I didn't know it well. Only when I was older, in prison, did I learn to speak Macedonian more easily. There was one teacher who would hit us when she heard us speaking Ladino. They tried to discourage us from speaking Ladino. There was no Macedonian taught in the schools and it wasn't even spoken much during the breaks. Whether you wanted to or not you had to learn the language. We had to try and learn Serbian. The Macedonians also learned Serbian. There were no Jewish teachers in the elementary school. They were Serbs. Back then it was the Kingdom of Yugoslavia , Macedonia didn't exist as Macedonia. We had religious lessons. The Christians had theirs and we had ours. In elementary school we had some kind of religious lessons but I cannot say what exactly we studied. In secondary school we had religious instruction. At the time the rabbi in Bitola was the father of Moric Romano, [Avram Romano] . The rabbi would come in the afternoons and give us lectures. Twice a week, for an hour each time, we had religious lessons. L-rd knows what we learned there, probably some Hebrew and some other things. I don't remember a lot about that. I didn't go to Lumdei Torah. [Editor's note: This school was called Lumdei Torah or Torah Learners, it was established by Yitzhak Alitzfen (1870-1948), the chief rabbi after WWI (1920s-1932). The institution was similar in function to a Talmud Torah but had a strong Zionist focus. Source: Mark Cohen]. After I finished elementary school, my mother sent me for a year to a workers' school where I learned how to sew. After that year I enrolled in the commercial academy and went there for four years. Mois finished the French school, Pepo finished gymnasium, and I went to the commercial academy. At that time in Bitola there were two options: gymnasium and commercial academy. The commercial academy was considered expert and the gymnasium general studies. After the gymnasium one went on to study [at university], but only a very few people went on to so. There were some other Jews in my class at the academy: Regina Sami and some boys like Eli Faradji, Jakov Kalderon. It was my parents wish that we get an education. They believed that it was very important that we finish school. I don't remember exactly when, I must have been around 12 or 13, the economic situation in Bitola turned bad and we had to live off the rents. My father's wheat shop didn't do well. He had another shop right next to his that he rented out, and the apartment. These rents were our main income. It was very hard to pay the fees for school, to buy books. It wasn't easy to educate children. I remember one time my mother told me that my father had to sell the gold around his pocket watch. At that time men wore round watches in their pockets. They sacrificed until the end in order for me to finish school. My mother and father never worried if I was studying or not as long as I passed the grade. They had no contact with the school. The only connection was my brother, with the little help he gave me. Anyway, my girlfriends and I helped each other with our lessons. I liked reading and read a lot when I was a kid. I don't remember my parents reading but my brothers read a lot of modern books. I also liked to read a lot as a kid. I remember reading the 'Good Earth,' 'Mati' by Maxim Gorky , Jack London. These were progressive books, Russian books, English authors. [Editor's note: 'The Good Earth' was written by American novelist Pearl S. Buck (1892-1973). Jack London (1876-1916) was an American author.] I didn't read political books. We went rarely, but, we did go to cake shops with my parents. In Bitola there was a theater and two or three movie theaters. We went to the theater, not often, but I remember that I went once with my parents. I went to the movies with my friends. You could go in whenever you wanted and the movie constantly repeated itself. There were a lot of films. I cannot remember the titles but there were films with Greta Garbo, with old actors. I was a member of Hashomer Hatzair. My whole childhood, I was in ken [a chapter of Hashomer Hatzair]. I was a member from around the age of 14. It all started when Moshe, the shaliach [an emissary], came from Israel. 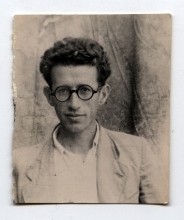 [Editor's note: He arrived in Bitola in 1932 from Kibbutz Merchavia. He understood Serbian and remained in Bitola for two years. He was very effective at energizing the youth and developing the organization in Bitola]. We would gather in ken. We were very progressive youth. We would go to matinees and dances, but we had our own life too. We gathered every day. Every day they gave us lectures about hygiene, world events, etc. And we were considered among the most progressive youth. This is where my brothers and I were involved. I led a 'kvutzah' [Hebrew for group] of younger children. The ken had its own building. Inside there was a kindergarten, a big hall, a yard. We gathered there, had lectures, and played in the yard. Even though there are no Jews left in Bitola today, I think the Jewish community of Macedonia received this building back. In Hashomer Hatzair we wore everyday clothes except when there was a special occasion. Then we wore our handkerchiefs, small pins, hats. When it was a formal occasion we wore this uniform, just like pioneers [see All- union pioneer organization] . The first time I was on a train was when I went to moshav [scouting camp run by Hashomer Hatzair]. This was when all the 'kenim' in former Yugoslavia came together. Every city had a ken. And they made moshavot, camping grounds, from the whole Yugoslavia. The Macedonians had one tent, the Vinkovci had one, the Belgradians had one. We cleaned, prepared the food, learned Hebrew songs, made campfires, told stories. I think that it lasted for fifteen days. Each year it was in a different city. One time it was here, in Macedonia, in Prespa [30 kilometers southwest of Bitola]. Every year in a new place; we never went to the same place two years in a row. This was nice because we all met. This was the first time I was out of Bitola. This was the first time that I bathed in a river. I'm very pleased with the way I spent my young life in ken. It was progressive, we exchanged all progressive books. Almost every Saturday evening we would get together. We put on plays for ourselves. This helped me to make a progressive social group for myself. I remember Bitola as a very cultured city. Bitola was an elite city, even more so than Skopje. It was called the city of the consuls. There was this French school. Not every city had one. French women, nuns, taught in the school. It was a modern city. When you went out on the promenade you were dressed up. Everyone went. Life wasn't divided into the religious and the non-religious. We all lived together. Religion was honored in the kal, in the church [synagogue]. Life was all together. There were a lot of poor people and a lot of traders who were well off. There were two sections of the Jewish quarter, 'la Tabane' and 'la Kalaze', plus a section for the poor, called Ciflik. There were no markers separating the neighborhoods but everyone knew where they were. Someone would ask, 'Where do you live?' and the other would reply, 'a la Tabane' or 'a la Ciflik'. Ciflik was like a ghetto. Everyone had one room. There was a basement. Maybe forty people lived there. There was a communal toilet and kitchen. The residents raised donkeys and went around to villages trading things. They were porters. The lower class lived there. I lived in the neighborhood called la Tabane. No non-Jews lived in the Jewish quarter but there were Jews who lived outside the Jewish quarter. I don't remember Rabbi Sabtaj Djaen . But I do remember the last rabbi, Rabbi Avram Romano. I was a kid and we didn't go to church [synagogue] often, maybe for the holidays. I don't know what kind of hierarchy there was in the church [synagogue] back then. There was a shochet that lived near us, maybe his name was Harachamim. He slaughtered chickens. They didn't sell slaughtered chickens; you bought a living one and took it to be slaughtered. There were special butchers that only sold kosher meat. My family bought there. The mikveh was in the center of the Jewish section, where they sold fruits, vegetables and other things. It was part of a complex of pools, baths. Sometimes I bathed in the pools, but not in the special one for the brides. Men and women didn't wash together. There must have been a schedule, maybe women went in the mornings and men in the afternoons, maybe there were separate days. I don't remember, but I know we weren't together. They heated the pools with wood or coal so that the water was hot. There wasn't a lot of room inside. There were two small rooms with one or two beds for resting after bathing. Inside it was tiled. There was a raised cement wall where people left their things while they bathed. You got under the faucets and bathed yourself. And on both sides of the pool there were cement seats. One person got washed while the other person was coming or going. I don't know how often I went. At home we poured water over each other to wash ourselves. I went occasionally. It wasn't entertainment to go, you went to clean yourself. One had to pay to use the pools. That's why we didn't go often. We had a community organization that kept records- of births, deaths. They managed all the administration for the Jews of Bitola. There was also a women's group, 'La Damas,' and it helped the poor people. They sent poor people to Belgrade to learn a trade. [Macedonia belonged to Serbia after 1913, and subsequently to Yugoslavia, with Belgrade as its capital.] Poor Jewish women came and cleaned other Jews' homes. They worked like this until they married. And in some cases the woman who she worked for would make arrangements for the girl's marriage. There were two market days in Bitola, Tuesdays and Friday. It was a city market, not a special one for Jews. There were a lot of Jews who sold vegetables and fruits. In the Jewish quarter there were only houses, no stores. Women in Bitola didn't go shopping at all. Around our house there was a ditch from the river and behind that a cattle market. We lived in a new house which was built the year I was born, in 1922. My father paid someone to build it. It had two floors. We lived on the ground floor and the tenants lived upstairs. The same tenants lived there for about 15 years. We lived together so long, it was like we were one family. I don't know why they left; I guess it was expensive for them. The upstairs apartment had a kitchen in the same place as ours. Both apartments were the same, except upstairs there was a small terrace. When they left we rented out the ground floor and we moved upstairs. The upstairs was better because it had a terrace and a view. When you entered there was an anteroom with steps leading upstairs. Our kitchen was inside and had a stove, a non-moving table with a stand and a closet around it to connect it. Instead of a refrigerator we had a cupboard: a box covered with netting to keep the bugs out. The air passed through since it was made from netting. We had a toilet next to the kitchen. There was also a space for doing the laundry. It was outside but covered with metal and with stones on the ground. Two rooms were used for sleeping. One room my parents slept in and that was also used for guests and eating. In the room we had a 'menderluk.' I would say that menderluk is a Turkish word which we use [in Macedonia]. Today there are no more menderluks, now there are couches, modern things. All houses in Bitola had one. There was a board with pillows on it and there was a table in the center and some chairs around. They weren't wide like the Ottoman ones; they were a bit narrower, so that you could lean back immediately. We have one in our weekend house in Marovo. I slept in this room with my mother and father. My brothers slept in the other bedroom. The third room was for trunks and things. At some point I started to use that room. We didn't have beds; we slept on mattresses on the floor. In the morning my mother would put them away in a closet in one of the rooms. My mother did this for us. There were two basements: one for us and one for the tenants upstairs. In the end we had electricity but I remember studying with a lamp. [Editor's note: The first electrical power plant was opened in Bitola on 24th December 1924. The plant was owned by a Jew named Todor Aruesti. First the main street was lit and later individual households installed electricity.] We were among the first in Bitola to install electricity but I don't remember when. We didn't have a radio; it was rare to have a radio. We didn't have a gramophone either. We had a water pump but we didn't have plumbing in the whole house. There was no water upstairs. Upstairs we had a boiler where we put water from downstairs. I remember Pesach the best. The people from upstairs and my family would always gather together for the reading of the Haggadah. I think that we read it in Ladino. I remember some of the text: 'Este pande la fresion ke, komeron pabre zentera inkera deaifto.' This means: 'This is the bread which our ancestors ate in the desert.' I used to wear a piece of that bread, bread without yeast, bojus [boyos], in a kerchief over my shoulder. We just sat at the table like that while they read the Haggadah. The men took turns reading. For Pesach we made boyos: unleavened bread. We made matzot from eggs and water mixed together to make something like cakes. [Editor's note: Probably they made some cake from matzah, water and eggs.] And we made 'macas d' vin' [matzot from wine]. Instead of water, you put wine. It was all without yeast. The one with wine was like biscuits and the others were round and they were pinched around the sides and had the form of a cake. And we made 'babamaca' from dough. It was a type of pie with raisins and matzot. A thin layer of dough was made with sugar into something like a pie. I remember the fularis we sent for Purim. They were special pastries with a hard-boiled egg inside, they weren't especially sweet. I would take them to my aunt's on a plate and they would bring the same to us. We children got dressed up. We had those noisemakers but I don't remember what they were called. On Chanukkah we lit the oil chanukkiyah which hung on the wall. We didn't make a sukkah because we didn't have a yard. But we went to neighbors for this special holiday. We celebrated Yom Kippur when we were little kids. But once we were older and the progressive youth started to gather we stopped. On Yom Kippur we would go on picnics and eat. My mother and father fasted but the kids didn't. My parents didn't know that we weren't celebrating or what we were doing. We hid this from them. My parents kept kosher but I don't know if it was that strict. For Sabbath my father didn't go to kal a lot. He went more for the holidays or when someone died, or for some special event. At home, I remember, for some time he put on a tallit and read something for Sabbath but that was just for a short time. We didn't have any special rituals for Sabbath. My mother cooked beans for Friday night in a special pot in the oven and around them she put dough. We ate eggs. Every Friday my mom made salty pies, cake - although there weren't so many cakes back then - and bread for the whole week. My father didn't work on Sabbath. And since my mother cooked the day before, she also didn't work on Sabbath. They relaxed, they took walks. In the beginning, for a short time, when I was really young, we had someone who came to light the fire on Sabbath. But then we got electricity. My parents weren't so strict with respect to this. It was a practice among Jews that every Friday poor people went from house to house with a bag. Some people gave them flour, someone something else, some gave money. They did this so that the poor could also celebrate Sabbath. My family collected money for Israel. We had a Keren Kayemet [Leisrael (K.K.L.)] box in our house. It was like a post box and we threw money in there. At one point we put a dinar or two in there every Sabbath or when there was some celebration, or when you felt the need to put some in. Someone would come once or twice a year to collect the money. They had a key, unlocked the box, took what was there and locked it up again. My brothers did have their bar mitzvah, but I was little and don't remember this. We didn't celebrate non-Jewish holidays at home. For Christmas the people who celebrated would have parades. They paraded with cars and carriages somewhere in town. Back before the war we ate a lot of beans, lentils and potatoes and chicken. For a wedding they would make roasted chicken with rice. The rice was called 'pilaf' and each grain was fluffed and separated. This was the most elite dish. For dessert we had 'pan d' Spanija,' Spanish Bread. Probably those that came from Spain [see Expulsion of the Jews from Spain]  brought this recipe with them. It was the most basic cake. You whipped eight to ten eggs added some sugar and baked it. Nothing else. This was the only cake we had, only 'pan d' Spanija.' We didn't have cakes like we do today; this was the most decadent cake we had. We didn't celebrate birthdays when I was a kid. I don't remember any Jews marrying non-Jews when I was young. However, I do remember that my cousin Zozef was involved with a non-Jewish professor from the gymnasium. But it was absolutely unthinkable that a Christian and Jew marry. This was the one case and they talked about how this man, who had a car and everything else, was doing something like that. I was a member of the Party [see Yugoslav Communist Party (KPJ)]  from 1941. I was in Hashomer Hatzair, the most progressive Jewish group. Around this time there was a dilemma in the organization: should the whole organization take membership in the Party or should we each become members on an individual basis. The 'rosh ken' at the time was a guy named Likac [Editor's note: In 1939 Elijahu Baruh, nicknamed Likac, came to Bitola from Belgrade. He was an instructor in the Zemun and Belgrade chapters of Hashomer Hatzair. He remained in Bitola until after the capitulation of Yugoslavia.] Likac wanted us to join the Party as an organization. But after a lot of discussion we decided to join as individuals. Slowly those that were more progressive became members of the communist party, some didn't, others were in SKOJ . For instance, my husband, Beno Ruso, was one of the first to become a member of the Party. Through him the party carried out its activities. I led three or four groups of girls that were in SKOJ; from the younger ones that I previously led in ken. They helped as couriers: carrying groceries, distributing money, knitting sweaters, hats, etc. for the partisans. Because of my father's involvement in the Ilinden Uprising my parents made no resistance when I began to actively work for the movement. They knew what I was doing and our house was even used for illegal activities. We kept some party materials at home and people from the movement would sleep there. It was very dangerous, but they didn't mind. Some Jews were active in these activities, others were not, but no one made problems. There were no traitors or spies among the Jews. In Hashomer Hatzair we talked about pogroms in Poland, expulsion from Spain; I heard about Hitler for the first time in ken. Anti-Semitism came after the occupation began, when the anti-Jewish laws were introduced [see Law for the Protection of the Nation] . It was not anti-Semitism on the part of the Macedonian nation; it was imposed from Bulgarians who came and occupied all of Macedonia. It was not national anti-Semitism. Bitola was bombed once or twice before the Germans came [see German Occupation of Yugoslavia] . I lived near the open fields where the German or maybe Austrian soldiers stayed. [Editor's note: Germany annexed Austria in 1938 (Anschluss) and the Austrians were drafted into the German army.] Then the Germans called the Bulgarians to come and govern Macedonia. Things went from bad to worse; the worst. There were so many laws against Jews starting when the Bulgarians occupied Macedonia in 1941. Every day there was a new law. We learned about the new laws from the Jewish community. I don't remember the details concerning the laws. No one had work and then it was forbidden to work. I was in Bitola the whole time up until the deportation of the Jews [of Bitola to Skopje] . During the war I read a lot and I attended a lot of meetings on behalf of the Party. There were communist committee meetings, and other meetings of the Party. These meetings were attended by small groups of people. I didn't have contact with the Bulgarian occupiers. None of my family tried to escape or run away. Pepo was employed in the municipality as a clerk, but I don't remember when he stopped working. I know that he was a clerk and that he had a salary. He was the only one that had one in the family. Jews were rarely clerks. Since I was a party organizer, we had a lot of meetings, especially at night. Wherever you were when the curfew was in force, that is where you remained the whole night. One night we heard rumors that the next day they were going to take the Jews. But we didn't know if they were going to take everyone or just young people who were able to work. So my two girlfriends, Adela Faradji and Estreje Ovadija, and I decided to sleep in a small store in the market, owned by another party member. It was a wagon-maker's shop- they sold boards, wheels, and such things. We stayed there to see what was going to happen the next day. If nothing happened, we would return home. I went home before that and told my mother that I wasn't going to come home that evening and left. It had snowed and was very cold. At 5 in the morning the blockade began and they began to collect the Jews from the Jewish neighborhood. We could hear them banging on the doors, how they called for people to get out, how people were crying. Many of the people gathered right in front of this shop. It was an old shop and we could look out through the planks and see how they threw the people out of their homes. I saw my friends who were taken. My parents were on the other side of the town, they weren't gathered in that marketplace. Then there was silence. We couldn't do anything. We just watched and cried. We were all very depressed and in a difficult psychological state while we watched what was happening outside. If it is someone you don't know you are sad, and you are even more so when it is your friends, your relatives, and when you think about your parents. Our fate was the same. The next morning our friend had to open his store so we needed to leave. Our friends from the organization found us a place in the basement of another small shop. We remained there until we received information that we could leave and join the partisans. In this other place we were together with Dzamila Kolonomos and a few other Jews from Bitola who had managed to escape the deportation. We were all in this little basement of a tobacco shop in the center of Bitola. The party [people] brought us food, news. They came at night. This is where we slept, relieved ourselves, where we were sick. The conditions were very bad. We were there until we received the order to leave. At that time the Bitola party organization had suffered from an infiltration in the villages. Because of this the partisans were inaccessible and people couldn't get orders to join them. The party organization in villages had been captured. We waited almost a month and a half in the shop basement. When we finally left we exited one at a time. Some got out safely. I did not. I left and was immediately asked by a Bulgarian agent for my identity card, but I didn't have one. The other person who left with me, a communist high school student, also didn't have an identity card. They put us both in prison. I was in prison from April 1943 until the liberation of Bitola on 9th September 1944 . The prison was right at the end of Bitola. There was a building there and in it the only prison. I don't know if it was a prison before the war. It probably was. I was the only Jew in the prison and was sentenced to 15 years. At some point they wanted to transfer me to some camp, but in the end they kept me in the prison. That's how I survived. Criminals and political prisoners were held there. The criminals were kept below and the political prisoners were on the first floor. Male and female. A small pantry was used for the women, since there were not that many women inmates. There were ten of us in very difficult conditions. In addition to communists there was also one prostitute, one smuggler. It was a general prison. We lived together, on friendly terms, for a year and a half. For me it wasn't hard. The others got food and we shared it. The Party sent me food through the mothers of the others who were in prison. What did we do all day in prison? We had an encyclopedia and studied things from the encyclopedia. That's where they have the most things to learn. We secretly received Marxist material, which we would read. When there were visitations, because I didn't have any family, I couldn't go out. But the others had parents who came once a week to visit them and bring them food. The food was always wrapped in some kind of paper. No one looked at the paper. Instead of ink they used lemon juice on their quill. We took a match or some other light, and could read what was written. That's how we maintained contact; how we got news from the outside world-our secret technique. We communicated with the men's cells in a similar way. Once a day we were allowed into the yard, first the men and then the women, first the criminals and then the political prisoners. We would throw away our waste, wash our faces, use the bathroom outside, and walk around about half an hour. Via the toilet we maintained connections with the men. In the toilet there were some bricks. I was almost the sole person who maintained these connections. We wrote what we wanted in a little book. We wrapped it in some paper, and put it in the toilet between two bricks. Then came some liberal guys: there were two, one was a barber. They would come to the closet [toilet] and take it. I would run straight to the closet and take what was left there. This is how mail was passed between the political prisoners. The prison authorities never caught on to us. Once I copied one chapter of the Communist Manifesto  or something. I had nice handwriting and in a small notebook I wrote in very tiny script and we sent this to one another. In fact the toilet was the place for communication. There was one terrible event that we lived through in prison. There were three partisans who had been sentenced to death. They were kept in prison for a long time. Then one night we learned that they were going to hang them. They hanged people in this prison in a special space. That night we had a special knock on the walls to signal that they were being taken to be executed. They took them from the men's cells. It was a very terrible thing when we saw how they took our friends to their execution. We didn't see it. I don't know their names. I never met them. They were from Prilepa [40 kilometers northeast of Bitola]. Eventually the Party made contact with the head of the prison. Since it was already the end of the war, Bulgaria had already capitulated, they said, 'if you do not release the political prisoners - there were three large cells of male political prisoners and one female cell - you will be killed.' And they released us, only the political prisoners; the criminals remained. We went straight to the partisans to Podmocani [30 kilometers west of Bitola] where we were given orders. I was instructed to stay in this place to work with women on behalf of the Party. Some went to the army, to partisans. I was in this place for almost a year, until the final liberation of Macedonia. I went to visit different villages to talk to women. We helped them organize and prepare for the new government. We visited women and told them they had to give food for partisans. I was in the Communist Party's Regional Committee. We worked for the Party then. That area had 20-30 villages. There were Albanian villages so we went with a woman who knew Albanian. This was political work. I didn't go home before going to Podmocani. We didn't think about our homes, only about the war ending, to work, to prepare food and everything that was necessary for the army. For a very long time I didn't know what happened to my family. All the time I thought that someone would come back. I couldn't fathom that they had killed everyone. I cannot say the exact date when I learned what had happened. But all the time I thought that someone would return. Even when I was in Skopje - I got work there afterwards - I thought that someone would appear. Only later did I learn that all the Jews had been killed in Treblinka . Maybe a year later. Before that I hadn't heard of Treblinka. I had heard about the camps but I didn't know that all of our people had been taken to Treblinka. This we learned slowly. I never returned to live in Bitola, not one day. I was there a few times for the 11th March commemoration [see 11th March 1943] . After the war I came to Skopje where I remained for the majority of my life. I worked for the finance ministry. 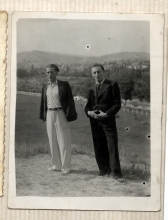 Beno Ruso and I were already together back in Hashomer Hatzair, then we worked together in the communist party organization. He was a member of the underground and through him we had some connections. Then he joined the partisans, and after the war we met again. We married in 1946 in Skopje. Let me look at my ring, it should say on there if it's a replacement of the original ring. It looks like it is a replacement. I lost one of these. I think it was June and if I'm not mistaken it was the 16th. Then marriages weren't celebrated. G-d forbid. We went from our offices, found two witnesses on the way to the municipality. Beno's brother, Dario, who had been a prisoner of war, got married to my friend Dora Nahmijas on the same day. Before the war we were friends but we didn't live in the same neighborhood; she lived in la Kaleze and I lived in la Tabane. But we were together in ken. 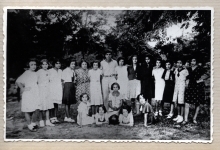 Dora fled to Greece before the occupation and from there she was sent with the Greek Jews to Auschwitz for a short time at the end of the war. After the war she returned to Skopje. She was skin and bones when we went to get married. After the wedding we all went to lunch together at Hotel Macedonia in Skopje and then returned to work. That was the whole ceremony. There was no special celebration, just the registration. These were civil marriages. I never wanted to have a Jewish wedding. That means nothing to me, especially at this time in my life. When my children got married I organized a very modest wedding for them. More than anything else I wanted them to go on a trip, to be happy. Some people make these huge weddings and waste so much money on them. To each his own. After the wedding the four of us lived in one room. At that time the municipalities gave out apartments. Many people had gathered in Skopje from all over Macedonia. You couldn't rent an apartment you had to be given one. I was given this one room. Then Beno came and we were there together. When we all got married Beno's brother and his wife came to live with us too. Four of us lived together in this one room with one bed. There was a small terrace next to the room so one night one couple would sleep outside and the next night the other. We lived like this a few months before we got one more room in the same building. And then we got a kitchen. Then we had a baby. That's how it was back then. We were young and we didn't think about it. We got a washbowl for cleaning but we couldn't get milk for the baby. It was very hard after the liberation. Slowly, slowly it was sorted out. Dora had a brother who went to Israel and called her to come. She and Dario went in 1948 or 1949, even though we didn't agree with their emigration. We didn't agree because his two brothers were here in Yugoslavia. And you know what, back then you looked at things differently. We needed talented people to rebuild Macedonia. And not to mention that in Israel there was great uncertainty; here life was more certain. They remained there and had two children: a son and a daughter. We stayed in contact and went to visit them three or four times. After the war I worked in the finance ministry. [My whole professional career] I worked in finance. After prison I first worked for the [Communist Party's] committee in Prespa, a region [in Macedonia]. There I worked with women. From there, as a little more of an intellectual, since I finished the [commercial] academy, I was transferred to Skopje to the Ministry of Finance, in 1945. There I made it to assistant to the minister. It all went very quickly because they didn't have staff in Macedonia. 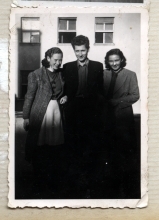 Then Beno was transferred to Nis [Serbia, 195 km south of Belgrade]. [My daughter] Berta was born in Nis in 1949. In Nis I worked for the regional district, this is a higher administrative level than a municipality, in the bureau for prices. Then Beno was transferred to Belgrade and there I worked in the National Bank. This must have been in 1952 because [my son] Iko [Isak] was born in 1954. There I didn't have any interesting function because I was always being transferred. Then we were transferred to Kumanovo [38 km northeast of Skopje] in 1956. There I was the head of the regional office for finance. The head of finance. From there I came back to Skopje and they took me back at the ministry. This was in 1957-58. I immediately got a function and quickly advanced to assistant to the minister of finance, then to under-secretary to the ministry of finance. I cannot remember the last title I held. It is not so important. Something between under-secretary and deputy. I retired when I turned 60 in 1982. [The level of activity] in the Jewish community varied through the years depending on who the president was. There was always continuity. We visited the community to the same extent [throughout the years]. But we had so many other obligations that were more important at the time. At that time Informbiro  was created, it was a time of crisis. There was a lot of work to be done, not only at work but after work as well. We were more occupied with the development of Macedonia. All of our friends had high positions: Shami was an ambassador and head of the Chamber of Macedonia, Moric Romano was an ambassador and a member of the Executive Council, Avram Sadikario was a doctor, Dzamila Kolonomos was on the Central Committee. We all had positions of responsibility after the war and were very engaged with them. We remained good friends with all of the Jews who survived from Bitola; we are like brothers, those of us who remained. The Jewish community existed, but in the last few years it has become more active. And now children have started to go. After the war I never had any problems because I was Jewish. We were all respected and had the best relations with everyone. After the war, we didn't celebrate Jewish holidays at home. We try to make sure that there is some better food for Sabbath but other than that at home we don't celebrate [Jewish holidays]. But they are celebrated in the community and we go there. We don't celebrate Christmas or Easter, G-d forbid. Never. Some people celebrate them. There are a lot of different people. The laying of the cornerstone for the future museum, they say, was so well- organized and the Jewish community has achieved a good reputation among the citizens. Building this museum is important, because it will be a lasting memorial to the Jews who lived here and who contributed to this country, as citizens of this country. It will be a permanent reminder of the Jews, even though there are fewer and fewer of us. [Editor's note: the cornerstone for a Holocaust Museum was laid in September 2005. The museum and accompanying offices and commercial space will be built with funds given by the Macedonian government as restitution of WWII.] If you take real Jews, those whose families were Jewish, there are very few of them. Real Jews who do you have? Me, Beno, Avram, Dzamila and Moric. All the others are from mixed marriages. They feel like Jews and that shouldn't be ignored. I never stopped being a member of the communist party. This was my ideology and there was never an end to it. We rarely speak Ladino between ourselves and my children never learned it. I'm never sure what I'm speaking: Macedonian, Serbian... Those languages are both so close to me that one minute I speak one and the next the other. I don't even notice when I switch from one to the other. But this isn't true for Ladino. I haven't spoken it for a long time, so it would be hard for me to express myself in Ladino. When the [Skopje] earthquake  happened we were in our apartment in the center. We felt it very hard there. One of our daughters was in Sarajevo [today Bosnia and Herzegovina] on a school trip. Beno and I and the two other children were home. There were a lot of buildings near us that were destroyed and many people were killed. The office where I worked at the time was very close to our apartment. That morning one of my colleagues happened to go to the office at 5am to finish some work and was killed. Even though our building was new at the time, and still standing after the earthquake, we lived for some time in a tent a bit outside the city. After the earthquake we lived in Kumanovo one year. Then we got an apartment in Skopje, near the airport, in one of these modern low-rise houses, like small villas. Then they built these apartments, where we live today, for the generals. There were no buildings here before; the government provided the land, and the army built the apartments in the 1970s. And we have lived here since. [I have three children, Berta, Vida and Isak]. Berta was born in Nis in 1949. She is a pediatric surgeon. Berta finished medical school in Skopje. She finished general medicine, then surgery, then pediatric surgery. And she also finished cosmetic surgery and now she is preparing her doctorate. She has two children who are alive, and one who died. Bojan is 27 and Maja 13. Darko, who died when he was seven, was in between them. He had a big defect on his heart. Twice they took him to London for operations, but they couldn't save him. That is why there is such a big gap between Bojan and Maja. Bojan graduated from the electro-technical faculty and is employed. While he was a student he worked as the secretary of the Jewish community. He likes to travel. He is going to Israel this Sunday. He is switching companies. He is always looking for something better. Since he is capable he is looking. So he is going to go for two weeks once he quits his job at the current company before he starts with the next. He has a cousin there [in Israel], my brother-in-law's son, and they are always writing to one another. When Berta isn't working she is with her children and at home. She works a lot with the kids at home. She loves flowers and gardens and likes to cook. She is a great housewife. She lives in the apartment connected to ours. Berta has been everywhere. I don't know where she hasn't been. She was in Egypt. She travels everywhere. Once a year she goes abroad. Her husband's name is Slavenko and he is a gynecologist and professor. Vida was born in 1947 in Skopje. She finished the electro-technical faculty in Skopje. She lives not far from us in Skopje. Her husband's name is Ljubomir but we call him Ljupco. He is an electro-engineer as well and has a studio for information systems. Vida has two daughters: Tanja and Jasmina. Tanja is about 30 and Jasmina is 27. They are both electro- engineers. Tanja works at USAID. She is quite progressive. She started her graduation paper but had to put it off for a while because she has a child one year and five months old. Jasmina isn't married. [In addition to finishing the electro-technical faculty] she also finished a post diploma degree in Hungary. All [of my grandchildren] are interested in their science. And computers are their main preoccupation. The little one already knows so much, and we know nothing. They all grew up in Skopje and went to elementary school, secondary school and university here. [Isak was born in 1954 in Belgrade. He finished the electro-technical university in Skopje.] My son, Isak, was a good man, an avid mountain climber. There was no place that he hadn't climbed including Kilimanjaro [today Tanzania]. As a young man he was in the mountain climbing club and in the end he finished his life on Mount Triglav [the highest peak of Slovenia, 60 kilometers northwest of Ljubljana]. It was in August  during a Macedonian holiday. We were at our weekend house in Mavrovo [75 km southwest of Skopje]. Our daughter Vida was with us but left to go back to Skopje. A while later, her husband came back and told us that Isak wasn't well. Only once we got home to Skopje did they tell me he had died. He was married to a non-Jew. He is buried in a non-Jewish cemetery in Skopje. At that time there wasn't even a Jewish cemetery, only a few graves. Now they have a Jewish section in the main cemetery. Anyway at that time we couldn't think about where to bury him, someone else took care of all that. Isak was the only alpinist in the family. Bojan does a little bit [of mountaineering]. All the grandchildren were in Israel. My grandchildren were in the Jewish camps. Maja just came back from Szarvas in Hungary. A family of electro-engineers, but they are not practical. They are advanced scientists. Slavenko, who is a doctor, knows everything practical about electricity. I didn't talk to my kids about the Holocaust; I didn't want to embitter their lives with what I had experienced. I gave my kids Jewish names in memory of my mother and my mother-in-law, who I didn't know as a mother-in- law, just as a lady. When I say Berta I remember my mother, when I say Vida I remember his mother. Neither of my children gave their children Jewish names. I did it as a memory to the dead. I had no reason to macedonianize my last name. I wouldn't run away from my roots. I'm not ashamed of this, I'm proud of it. There was no difference between people. Every year we went on vacation. We visited the entire Croatian coast, Ohrid, everywhere [in former Yugoslavia]. The vacations were at most fifteen days. There is almost no place in former Yugoslavia that we haven't visited. We were in Israel, I was there three times and Beno was there twice. We were in the former USSR. I cannot remember the year, but it was about the time we retired because until we retired we couldn't travel that much. We went to Russia with a group. We also went to Spain to see our Spanish language in use. We chose Russia because Leningrad attracted us. We heard that there were a lot of beautiful sculptures and many interesting museums there. We were there ten days at the most. We had a desire to see Russia and Spain. To these two countries we went together. While I was working I was always going on pleasure trips abroad. I was in Italy, Greece and in Hungary and in Romania. At the time unions were active and we always organized some trips like this, union trips, group trips and that's it. I went without Beno. He didn't have a desire to travel like this, in a group. Only when we were in Spain he liked it. I don't know why. He was in Russia once by himself for the celebration of Liberation Day: the day marking the end of the war, the day of Victory [see Victory Day in Russia (9th May)] . There was a parade in Moscow and he went as a delegate. I don't know what year. He went through the Federation of Fighters. I love my weekend house and to travel, but I no longer have the strength. I really like it and my children do too. How often we go depends on when we are free. Sometimes two months in the summertime. For a long time I couldn't bear thinking about Germans. When I would go on vacation and see Germans I hated them. For a long time I couldn't forgive them for what they did to me and the whole world. My husband cannot imagine going to Bulgaria. I say, 'Let's go to Bulgaria. There are nice things there.' But he won't go. They were the implementers. Things change, but for a very long time I couldn't see that. When I think about it now: they were one generation and this is another. I get a minimal amount [of restitution money] once every three months from somewhere but I don't know where. It is because I was in prison. I was in Israel three times to visit because my brother-in-law was there with his wife and children, and a lot of friends from Bitola were as well. We never thought to live there. We always thought to stay here where we were needed. I lived through the break-up of Yugoslavia with great difficulty. And today it's very hard for me to accept that we are divided. Because we had... I don't know... since I, we all, citizens here, and not only professionally, we always had meetings with all the republics and we all got along. I'm thinking of Slovenians, Macedonians, Montenegrins... At those meetings I never felt that I was being degraded or less worthy. I'm sad that Yugoslavia broke up. I'm very sad. Something needed to be changed. The system wasn't absolutely the way it should be. There were attempts to reform the system, but they didn't work out. In any case, it would have been better if there hadn't been a break-up, but that a new model had been found instead. Now it's much harder to move towards Europeanization. Then there was a chance for one industrialized and rather developed, prominent country. Now we are all no-one and nothing, as they say. Everyone lost. No- one got anything out of this war, and we could have all gone forward. Today I spend most of my time at home. Since I cannot read, I have a big handicap. I cannot read because my eyes are not well. I cannot see. I can see general things, but I cannot read or watch TV, I just listen. It is very hard for me. As long as I could see, I knitted and all those kinds of things. Now I'm limited in what I can do. I clean and prepare things. I go with my five friends for a coffee once a week, on Tuesdays. We sit and talk for two hours and that's it. They are Macedonians and there used to be more of us before they died. Dzamila used to come, but now she is sick too. She and I have been friends for forever. It is just a coincidence that we live on the same street, but it is good that we live close to each other, although we see each other less and less. We are all at home more and more. I'm satisfied with my life and my childhood except for what happened to the Jews. If it hadn't happened my life surely would have been better. What we lost we cannot get back. It eternally tortures us. Simply, it is the darkest part of my life, to loose everything at once. But that's the way it is. I'm entirely satisfied with what I gave and what society gave to me and my family. All my children are on the right path, my grandchildren and even my great-grandchild, Kalina, which means pomegranate in Macedonian. When I was a kid, I didn't pay much attention to what was happening in the kitchen. My mother was there and it was her job to do the cooking. As a student I was a little spoiled. I went to school and afterwards I had to study and then I went to ken. So, I don't know exactly how they made meals before the war. Only after the war, when I started my own family, did I start to cook. But I do make burikitas, little rolls. [This versatile and long lasting baked good was very popular among the Sephardi Jews of Bitola. The rolls were stuffed with a variety of fillings including meats, fruits, nuts, and cheese. Burikitas were eaten all the time but were also a staple for Sabbath breakfast along with hard-boiled eggs and aniseed brandy.] For the dough I use one and half cups of oil and three cups of water. I mix them and heat them up with a little salt. When it is hot I take it off the heat and add between three quarters and a kilo of flour while the liquid is still hot. I knead it so it is nice and soft, not hard. I make a few balls and roll them out and cut out circles with a glass. I mix some white cheese and an egg yolk. I put a little of this cheese-egg mixture in the center of the round, fold it in half and seal it. Then I brush it with a little egg. And bake it in the oven. Tito, Josip Broz (1892-1980): President of communist Yugoslavia from 1953 until his death. He organized the Yugoslav Communist Party in 1937 and became the leader of the Yugoslav partisan movement after 1941. He liberated most of Yugoslavia with his partisans, including Belgrade, made territorial gains (Fiume and the previously Italian Istria). In March 1945 he became the head of the new federal Yugoslav government. He nationalized industry but did not enforce the Soviet-style collective farming system. On the political plane, he oppressed and executed his political opposition. Although Yugoslavia was closely associated with the USSR, Tito often pursued independent policies. He accepted western loans to stabilize national economy, and gradually relaxed many of the regime's strict controls. As a result, Yugoslavia became the most liberal communist country in Europe. After Tito's death in 1980 ethnic tensions resurfaced, bringing about the brutal breakup of the federal state in the 1990s. Ilinden Uprising: A failed national uprising against the Ottomans in Macedonia, carried out by VMRO (Internal Macedonian Revolutionary Organization) between August and November 1903. The rebellion started in the Bitola region on St. Elijah's Day (2nd August), hence the name. The rebellion received the support of the local Slav and Vlach population and provisional governments were established in three localities. The intervention of the Ottoman regular army led to the dissolution of the uprising. During the uprising normal life in Bitola came to a halt. Over 15,000 people fell victim, 12,000 houses were destroyed and 30,000 people fled to neighboring Bulgaria. After three months of fighting the country was in shambles. Jewish participation in the National People's Army: By 1941 many Jews had begun to cooperate with the communist partisans who fought against the occupying forces. By 1942, 30 Jews from Bitola belonged to the Communist Party, another 150 had joined the Federation of Communist Youth (SKOJ) and about another 650 assisted the partisans. The great many of these were deported but some 50 survived and joined the partisans [Source: Mark Cohen]. Hashomer Hatzair in Yugoslavia: Leftist Zionist youth organization founded in 1909 by members of the Second Aliyah, many of whom were active in revolutionary movements back in the Russian Empire. In the diaspora its main goal was to prepare Jewish youth for the hard pioneering life in Palestine. It was first organized in Yugoslavia in 1930. Kingdom of Yugoslavia: Upon the collapse of Austria-Hungary in 1918, Serbia had won high praise by the League of Nations members, while Croatia and Slovenia were in danger of losing land to the Italians after siding with the Austrians. In an attempt by European powers to unite all Southern Slavs, Croatia and Slovenia joined the Kingdom of Serbs, Croats and Slovenes on 1st December 1918. The dominate partner in this state, which included Montenegro, Bosnia-Herzegovina and the regions of Vojvodina and Macedonia, was Serbia. In 1929 it adopted the name Yugoslavia. Despite the name change it did not resolve the ethnic division that were already bubbling beneath the surface in the new entity. Rabbi Avram Romano (1895-1943): He was born in Sarajevo and arrived in Bitola in 1931. He served as the last chief rabbi of Bitola. He was a supporter of the Zionist cause and used his position to promote this ideology. Part of his mission was to bring the dire condition of Bitola's Jewish community to the attention of other Yugoslav communities in an effort to raise support for this poor community. He was killed in Treblinka. Bulgarian Occupation of Macedonia in World War II: In April 1941 Bulgaria along with Germany, Italy and Hungary attacked the neighboring Yugoslavia. Beside Yugoslav Macedonia Bulgarian troops also marched into the Northern-Greek Aegean Thrace. Although the territorial gains were initially very popular in Bulgaria, complications soon arose in the occupied territories. The oppressive Bulgarian administration resulted in uprisings in both occupied lands. Jews were persecuted, their property was confiscated and they had to do forced labor. In early 1943 the entire Macedonian Jewish population (mostly located in Bitola, Skopje and Stip) was deported and confined in the Monopol tobacco factory near Skopje. On 22nd March deportations to the Polish death camps began. From these transports only about 100 people returned to Macedonia after the war. Some Macedonian Jews managed to reach Italian-occupied Albania, others joined the Yugoslav partisans and some 150-200 of them were saved by the Spanish government which granted them Spanish citizenship. Rabbi Sabtaj Djaen (1883-1946): He was born in Bulgaria and served as the chief rabbi of Bitola from 1924-1928. Prior to this post he held rabbinical positions in Sarajevo and Belgrade. He was a strong proponent of Israel and worked hard to encourage emigration to Palestine. During his tenure he also raised money in the Americas on behalf of the poor Jews of Bitola. He also made some revolutionary changes in Bitola's religious life, such as removing the mechitzah [divider] from the Kal Aragon synagogue. After Bitola he was chief Sephardi rabbi in Argentina and later in Romania. He died in Argentina in 1946. Keren Kayemet Leisrael (K.K.L. ): Jewish National Fund (JNF) founded in 1901 at the Fifth Zionist Congress in Basel. From its inception, the JNF was charged with the task of fundraising in Jewish communities for the purpose of purchasing land in the Land of Israel to create a homeland for the Jewish people. After 1948 the fund was used to improve and afforest the territories gained. Every Jewish family that wished to help the cause had a JNF money box, called the 'blue box'. In Poland the JNF was active in two periods, 1919-1939 and 1945-1950. In preparing its colonization campaign, Keren Kayemet le-Israel collaborated with the Jewish Agency and Keren Hayesod. Expulsion of the Jews from Spain: The Sephardi population of the Balkans originates from the Jews who were expelled from the Iberian peninsula, as a result of the 'Reconquista' in the late 15th century (Spain 1492, and Portugal 1495). The majority of the Sephardim subsequently settled in the territory of the Ottoman Empire, mainly in maritime cities (Salonica, Istanbul, Smyrna, etc.) and also in the ones situated on significant overland trading routes to Central Europe (Bitola, Skopje, and Sarajevo) and to the Danube (Adrianople, Philipopolis, Sofia, and Vidin). SKOJ (Alliance of the Communist Youth Yugoslavia): The organization was established in Zagreb in 1919 and was closely tied to the Yugoslav Communist Party. During World War II many of its members were imprisoned, others joined Tito's partisans and participated in the anti-fascist resistance. Law for the Protection of the Nation: A comprehensive anti-Jewish legislation in Bulgaria was introduced after the outbreak of World War II. The 'Law for the Protection of the Nation' was officially promulgated in January 1941. According to this law, Jews did not have the right to own shops and factories. Jews had to wear the distinctive yellow star; Jewish houses had to display a special sign identifying it as being Jewish; Jews were dismissed from all posts in schools and universities. The internment of Jews in certain designated towns was legalized and all Jews were expelled from Sofia in 1943. Jews were only allowed to go out into the streets for one or two hours a day. They were prohibited from using the main streets, from entering certain business establishments, and from attending places of entertainment. Their radios, automobiles, bicycles and other valuables were confiscated. From 1941 on Jewish males were sent to forced labor battalions and ordered to do extremely hard work in mountains, forests and road construction. In the Bulgarian-occupied Yugoslav (Macedonia) and Greek (Aegean Thrace) territories the Bulgarian army and administration introduced extreme measures. The Jews from these areas were deported to concentration camps, while the plans for the deportation of Jews from Bulgaria proper were halted by a protest movement launched by the vice-chairman of the Bulgarian Parliament. German Occupation of Yugoslavia: On 25th March 1941 Yugoslavia signed the Tripartite Pact, allying itself with Hitler. Two days later, however, a bloodless coup d'etat took place in Belgrade, led by a Serbian general, Dusan Simovic, evidently in opposition to the government's pro-Axis policies. As a result, on 6th April, German bombers attacked Belgrade, while the Italians struck Dalmatia; shortly after, Hungarian and Bulgarian troops also invaded the country. Within less than two weeks the Yugoslav armed forces surrendered. 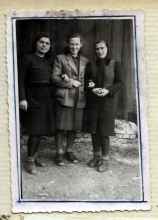 Yellow star in Bulgaria: According to a governmental decree all Bulgarian Jews were forced to wear distinctive yellow stars after 24th September 1942. Contrary to the German-occupied countries the stars in Bulgaria were made of yellow plastic or textile and were also smaller. Volunteers in previous wars, the war-disabled, orphans and widows of victims of wars, and those awarded the military cross were given the privilege to wear the star in the form of a button. Jews who converted to Christianity and their families were totally exempt. The discriminatory measures and persecutions ended with the cancellation of the Law for the Protection of the Nation on 17th August 1944. Deportation of Jews of Bitola to Skopje: On 11th March 1943 all the Jews of Macedonia were collected and taken to a temporary collection center in Skopje at the Monopol tobacco factory. This round up and deportation of the Jews from Bitola was executed by Kiril Stoimenov, the inspector of the Commission for Jewish Questions. At two in the morning the city was under a blockade, at five the carefully assembled forces informed the Jewish population to prepare for a trip and at seven they began the deportation to the Monopol tobacco factory in Skopje. Communist Manifesto: The Communist Manifesto was first published in February 1848 in London. It was written by Karl Marx and Friedrich Engels for the Communist League, an organization of German emigre workers living in several western European countries. The manifesto's critique of capitalism and its deleterious effect on all aspects of life, from the increasing rift between the classes to the destruction of the nuclear family became one of the most widely read and discussed documents of the 20th century. Treblinka: This facility was originally built in 1941 as a slave labor camp. In 1942 the Nazi constructed a second camp Treblinka II, with ten gas chambers, to serve as an extermination camp. At the height of its operation the Nazis were able to kill 15,000 people a day. Three thousand two hundred and seventy six Jews from Bitola were killed there [Source: Mark Cohen]. 11th March 1943: On this day all of the Jews of Macedonia were rounded up and taken to a temporary camp in the Skopje tobacco factory, Monopol. They remained there for eleven days before the first of three transports transferred them by cattle car to Treblinka in Poland. Almost 98 percent of the Macedonian community was annihilated in this action. Informbiro: Information Bureau of the Communist and Worker's Parties (Informbiro) was established in Warsaw in 1947. The organization was headquartered in Belgrade until the dispute with Russia began in 1948 when it moved to Bucharest. In June 1948 Stalin made a resolution accusing the communist party of Yugoslavia, among other things, of not holding true to the values of Marxism-Leninism. The resolution expelled the Communist Party of Yugoslavia from the Communist Information Bureau and thus it fell outside the Soviet control. This period was also marked by dissent within the communist party of Yugoslavia and the subsequent repression and imprisonment of political opponents, notably in Goli Otok. The Informbiro was dissolved in 1956. Skopje Earthquake of 1963. Half of the city of Skopje was destroyed, and over 1,000 people were killed, in a devastating earthquake on 26th July 1963. The city was rebuilt after a great deal of funds was channeled there from the Yugoslav government and people as well as an extraordinary contribution from foreign governments.